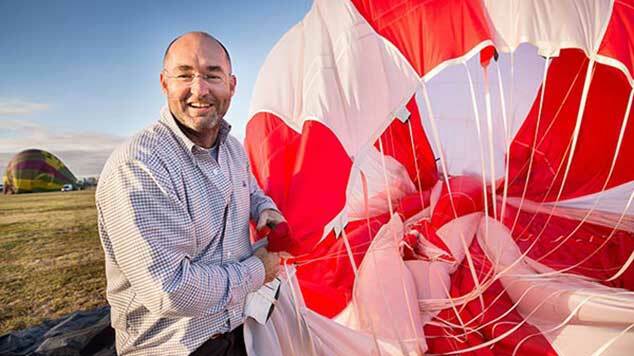 Chief Pilot Chris Shorten, “BalloonMan“, a Melbourne native has vastly more experience operating passenger hot air balloon rides over Melbourne, Victoria Australia than any other pilot. When you fly with Balloon Flights Over Melbourne you always fly with Chris, and you can rely on our experience and professionalism to ensure you receive the best Melbourne has to offer. Experience counts for a great deal in hot air ballooning. Not only does it ensure we choose to fly only when the weather conditions are best, we are also sure to select the best launch site each day to provide you with the best views over Melbourne. Chris was instantly attracted to ballooning when he received a surprise gift to fly at sunrise in the Grampians, North West of Melbourne experiencing the magical thrill of open air flight. The very next day he was a balloon man, part of the ballooning team learning the ropes – from the ground up, so to speak. That was back in 1993 and Chris the BalloonMan now has 3000 plus hours as pilot in command of a passenger hot air balloon. Nobody has flown as many passengers safely in a hot air balloon over Melbourne. Balloon Flights Over Melbourne only fly new aircraft with all new avionics equipment on board. We are the holder of Air Operator Certificate VT598425-01 issued by the Civil Aviation Safety Authority (CASA). ” Your safety is always our first priority. Our work safety practices and procedures have been refined over many years operating hot air balloons to ensure our passengers and spectators alike are not exposed to any unnecessary dangers. Melbourne, Victoria Australia provides an ever changing palette – every single day the wonder and beauty we enjoy is splashed across the sky. Dawn provides the richest colours and most romantic moods to create the ultimate atmosphere for your ballooning over Melbourneexperience to be the best thing you have ever done. The romance of Melbourne at dawn is an experience everybody should have at least once in their lives. Melbourne, Victoria hot air ballooning experience.